Post and beam construction methods date back 300 years. A post and beam house is both sturdy and functional. The dramatic posts and beams are classic in their appeal and the structures are exceptionally strong! Exactly like it sounds, post and beam construction is a system of building that has a framework made of vertical posts and horizontal beams. The posts and beams are held together by lag bolts, spikes or metal brackets. Sometimes wooden pegs (often oak) are used, decoratively, to give the post and beam structure the look of a timber frame home. In a post and beam home, the pegs are not holding anything together. 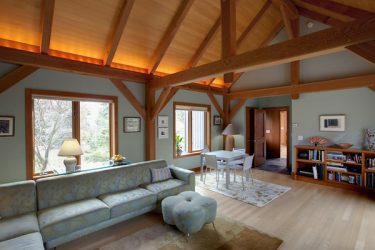 In a post and beam house, unlike a timber frame home, the floors are each built independently—not all at once like in a timber frame house. 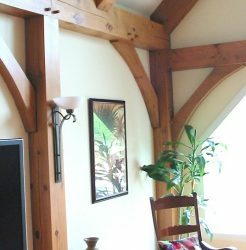 Post and beam construction includes beautiful exposed posts and beams inside the home. Most people can’t tell a post and beam home from a timber frame home. But, many people choose to use wood pegs, decoratively—so their posts and beam homes can LOOK LIKE timber frame construction. 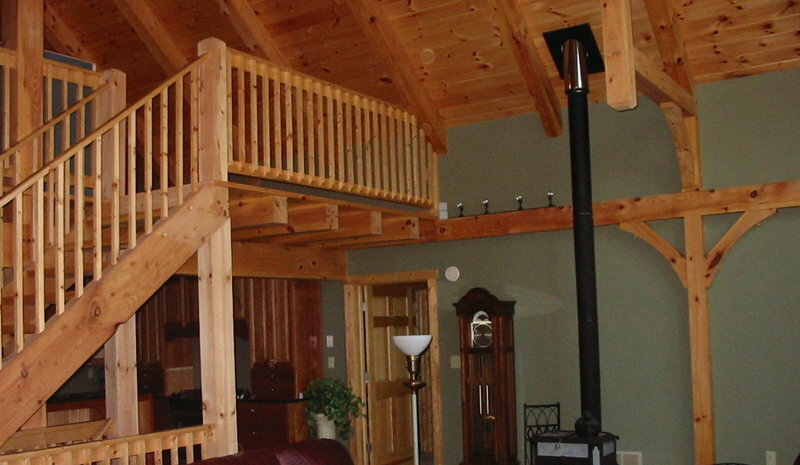 This great room addition was built using post and beam construction. Cost – They cost less than a timber frame home, but you can achieve the same “look”. Post and beam houses give budget conscious home buyers the look that they want—without the high cost! Strength – Post and beam homes have stood the test of time. Many colonial homes, built hundreds of years ago, are still in use. Green building – Homes built this way have respect for the environment, mostly using materials that are eco-friendly and renewable. Energy efficient – Both timber frames and post and beam homes, using energy efficient windows and walls, are very energy efficient and money saving for energy costs. Beauty – Natural beauty that can’t be duplicated with man-made materials. In tune with nature – Looking out your windows at a magnificent view, you almost feel that you are part of the view. Post and beam houses are built to match the lifestyle of the owner. Some are built like mountain lodges or ski lodges. Others capture a rustic country spirit. Still others feel like an ocean side beach house. But the secret to post and beam construction—is that the magnificent beauty of the beams—remains a secret–to someone looking from the curb!